click here and Make a note of the type of Paper you want for your inside pages. 80lb Gloss-Coated Paper. This paper is ACID-FREE and is white in color. It does not have a watermark. But unlike regular copy paper, it is also coated with a gloss finish that makes it perfect for printing photos, charts & graphs, and more. 80lb Matte-Coated Paper. This paper is ACID-FREE and is white in color. It does not have a watermark. But unlike regular copy paper, it is also coated with a matte (non-gloss coating) finish that makes it perfect for printing photos, charts & graphs, and more. 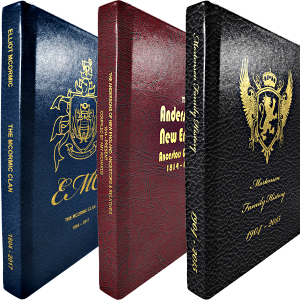 click here to Choose the type of Binding you want for your book. Binding option 1 of 3. Fabric Hardcover Binding with Lettering and Emblem applied with foil. 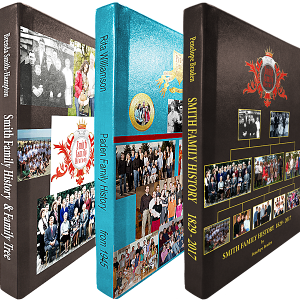 Great for Genealogy and Family History books, Thesis & Dissertations, and other Heirloom books. Option 2 of 3. 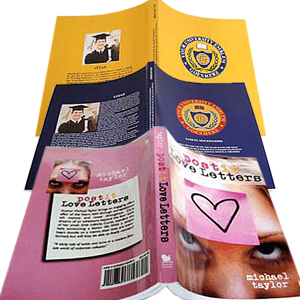 Printed Hardcover Binding with full color graphics and lettering. Great for Class books, Event books, Yearbooks, Family books, Instruction books, etc. Available in custom sizes up to 12×18 inches. Binding option 3 of 3. Perfect Binding is the Softcover version of Printed Hardcover binding. Great for Instruction books, Poetry books, Story books, etc. Available in custom sizes up to 8.5×11 inches. click here to Make your book available for sale on Zaragon Books. After you receive your book, fill out and submit the Publish Request Form below. If you want to markup the price of your book so that you receive a royalty from every sale, choose that option and enter the royalty amount you want. This option is perfect for School Yearbooks and other fundraising publications. We’ll create a page for your book. Click here for sample book page. We’ll email you with a link to your book listing page. You can then share the link with the people you want to buy your book. Note that your book can also be found with the search box on this site. You will receive an email notification every time your book is sold. We’ll also send you a user name and password so you can log in to Zaragon Books and update the description of your book whenever you want.